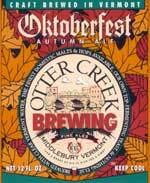 This offering from Otter Creek pours a medium amber color, clear body, with a small, fizzy off-white head. Virtually no lacing over a fully diminishing head. Aroma is odd...the first whiff is very undesirable, but balances out slightly once it's in our sniffers. Specific aroma is indistinguishable. Taste is oddly similar to water, neither bitter nor sweet. Light body, dry on the palate, with lively carbonation. Malty finish.